- What would it cost you to find out? 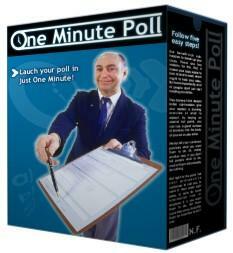 With this astonishingly easy-to-use new product, One Minute Poll, anyone with a Website or email list can create click-to-respond surveys with a fully professional 'look and feel' in just minutes - with numeric/graphic results you can view in real time - at far less cost than ever before! The only special skills you need are (a) the ability to create meaningful questions for your prospects/customers; (b) the ability to install a simple link to your finished survey on your page or email text. Satisfaction guaranteed. Click here for complete information, or to buy now.